AWWThis Will Make You So Sad For ‘Teen Beach 2’ Actress Grace Phipps! Before hitting it big on Disney Channel, Grace Phipps was a shy student who got bullied relentlessly. "I used to eat lunch with the teachers at school," she opens up about her time in the cafeteria. "I just remember that kids would put their legs on the seats next to them so that I wouldn't have a place to sit." As heartbreaking as that sounds, Grace found the courage to rise above — read her inspiring story in the new issue of J-14, on stands now! You'll also find in-depth, personal stories from so many other stars. Cara Delevingne opens up about her struggle to be seen as more than just a pretty face, Dove Cameron confesses that she misses her late father every day, and Cameron Dallas divulges what it felt like when haters made fun of his music. 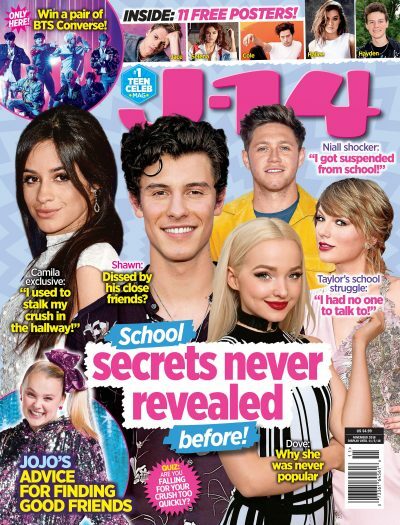 It's all in the new issue — so pick up your copy now!